No matter what your politics are, there is little doubt that the job of President is a pretty tough gig. 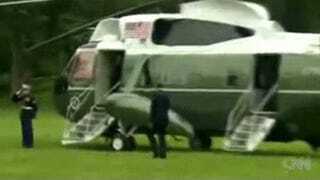 It appears President Obama had a lot on his mind on May 29th as he forgot the customary salute to the Marine guard in full dress uniform before boarding VH-3D chopper. Before moving into the cabin he realized or was reminded that he screwed up and hopped back out to make it right. I wonder if the pilot reminded him?